In April I participated in my first Cara Box exchange hosted by Wifessionals. The theme was "Go Green." I sent to a box to Crissy who blogs at Live Love Dew. I received a box from Lindsey who blogs at Follow the Ruels. How funny is it that Lindsey gave me a reusable bag and herbs and I gave those things to my swap partner too!?! Great minds think alike! The reusable bag is too cute and so much more fun then the black ones I have. I can always use another container for bringing lunch to work. And the herb garden. . . I may just need to get a green thumb and try to grow something! Ha! It was so much fun participating this month. I loved chatting w/ both ladies over email and reading their blogs. Have you participated in Cara Box yet? May's theme is Let's Get Regional which I could have a lot of fun with!!!! Head over to Wifessionals to sign up! The new memorial is at the intersection of Boylston Street and Darmouth Street at the park area known as Copley Square. The media is still there. I wonder how long they will stay? I only hope they will continue to focus their "news" stories on the recovery of the resilient victims, the amazing first responders and the everyday heroes who helped on that terrible day. I can't get enough of the GOOD stories. 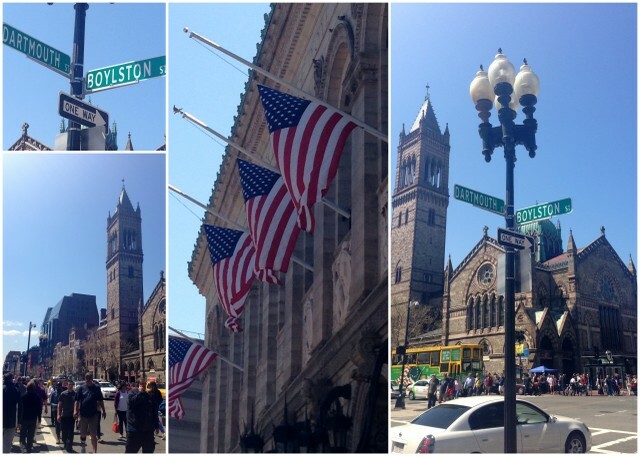 The flags around Boston are still at half mask. Just another reminder of the lives lost. 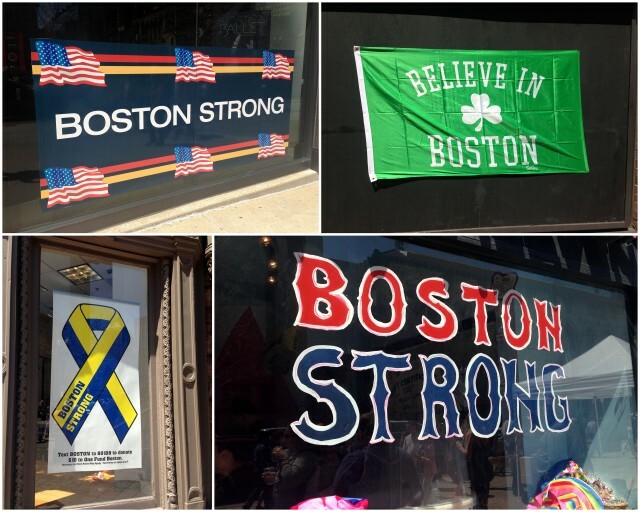 The windows of Boylston Street shops are filled with "Boston Strong." I couldn't help but smile as I walked down the street. So much support everywhere you look. The Forum (pic on left) is where the 2nd explosion went off. 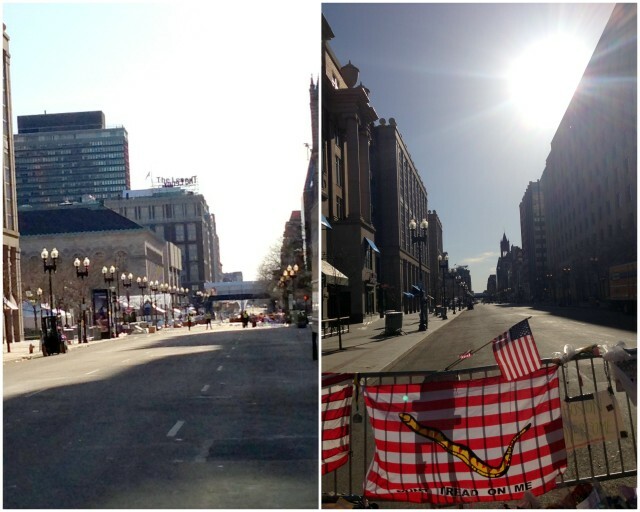 Marathon Sports (pics on right) is where the 1st explosion went off (near the finish line). As you can see from the pictures these two locations are still boarded up. I'm guessing it will be a bit longer before they re-open. This is the memorial. It is so beautiful and touching with so much sadness yet I didn't feel sad when I visited. Does that even make sense? It is the first time that I didn't get teary eyed. Maybe it was the beautiful sunny day? Maybe it was the hundreds of people paying their respects? 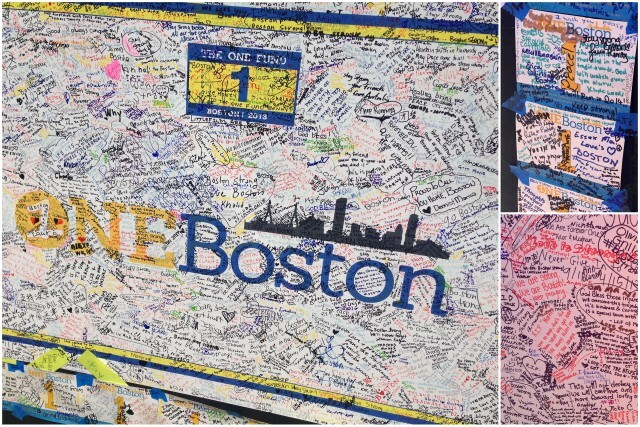 Maybe it was the hopeful messages written all over the memorial? Maybe it was a combination of it all? Whatever it was, it was great. The four crosses - one for each person who was killed - are placed in the center or the memorial. There are two large boards to sign. There were plenty of markers just no room left to write! There must be a million messages on these boards! 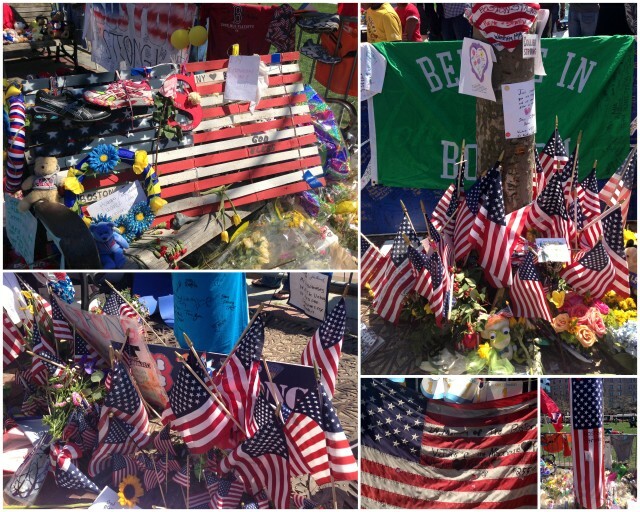 The memorial is filled with American flags, stuffed animals, sneakers, hats, letters, candles, crosses, tee-shirts, flowers and other tokens. It really is breathtaking. 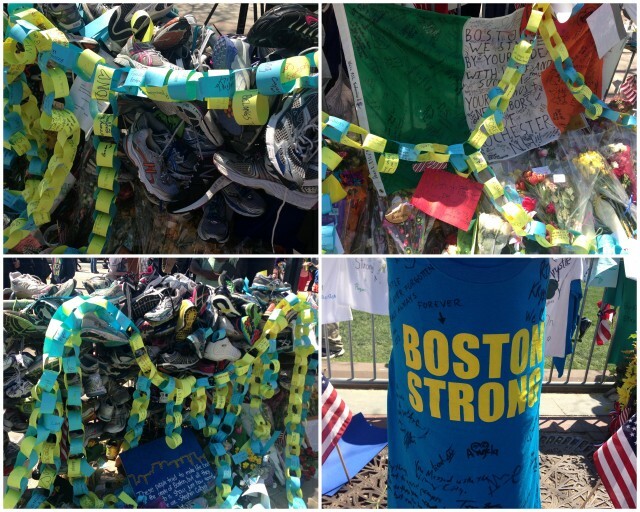 There is a paper chain in Boston Marathon colors - blue and yellow - that runs through much of the memorial. There are messages on each link of the chain. 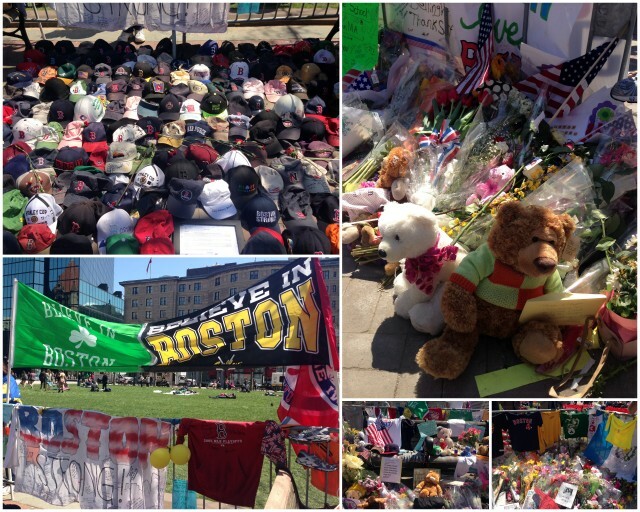 Seeing this memorial is just another reminder that Boston is an amazing city. The people of Boston are good people. 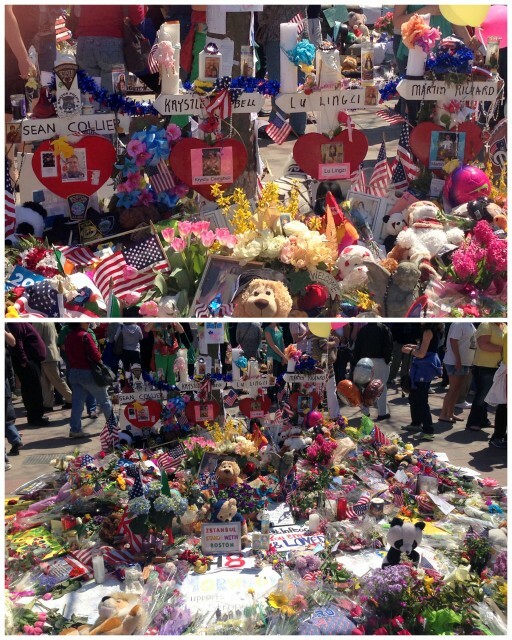 Whoever was in charge of "organizing" the items in the memorial did an outstanding job. I can't even imagine how many hours it took to move/place each item. You can really tell that whoever was responsible put so much care and love into it. I only hope that the rain stays away so that this memorial can stay looking this way for a bit longer. I also hope they take pieces of it for a permanent memorial or museum. 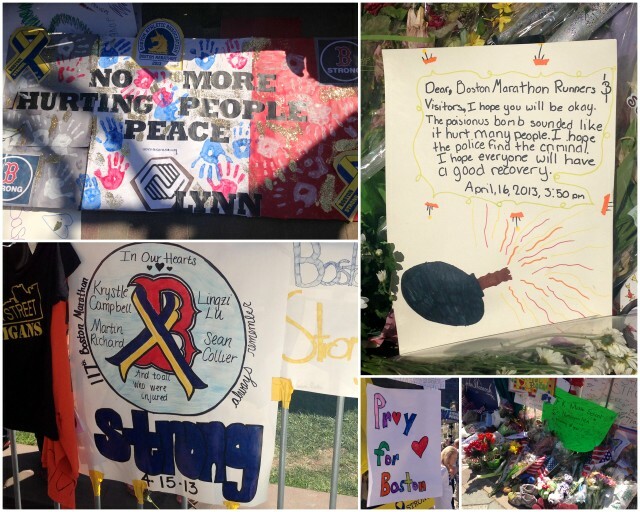 It will be a lasting reminder of the love for the victims. I feel like I've been looking at Boston in a different way over the past couple of weeks. It is a city I've lived in for a long time. I'm walk the streets of Boston often. But now I look at things in a different way - maybe with a new appreciation? I'm linking up with Helene for Travel Tuesday. This weekend in Boston the weather was GORGEOUS! It is about time!!!! 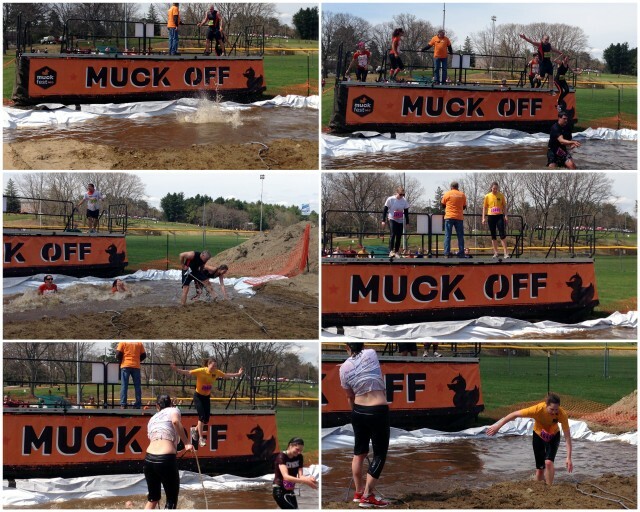 So happy I already had planned to spend Saturday outside at the MuckFest MS. Not sure what the heck MuckFest is? 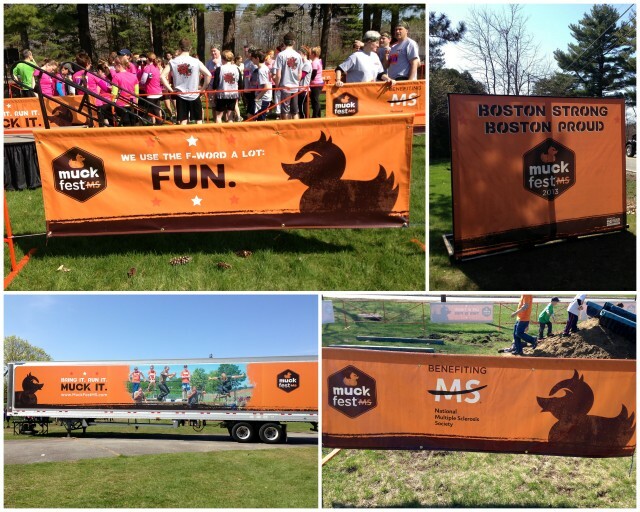 It is a 5 mile run with multiple obstacles and participants get very "mucky" all while support MS! The Bean Team had 10 members (well 11 if you count me as the team photographer and cheerleader). My cousin Katelyn (bottom left photo) was captain and did a great job at recruiting her friends/coworkers. Doug, who ran the marathon with Katelyn 2 years ago (on the MS team) also came! 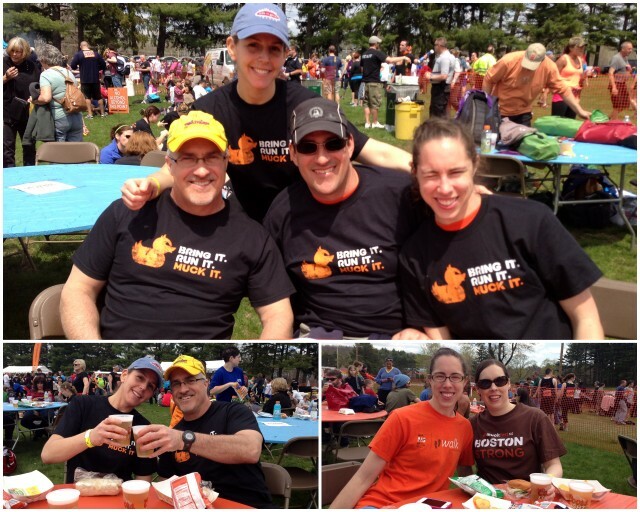 My friend Jaime (top right photo) who lives on the Cape drove almost 2 hours to be there (the event was in Devons, MA). This event had some great signs and slogans. 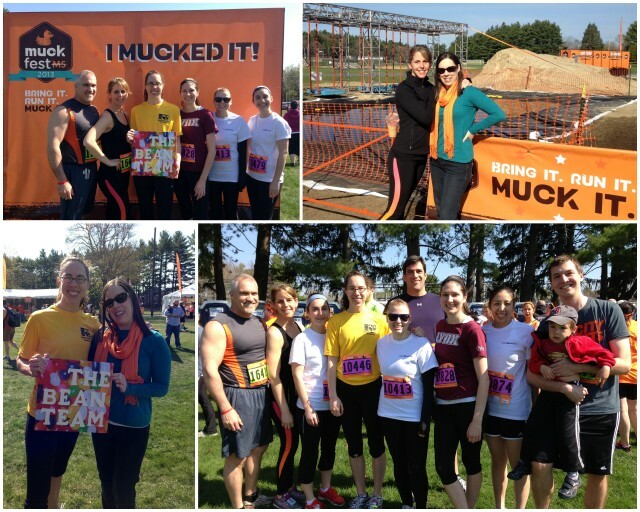 You can have a lot of fun with the word "muck." Ha! While The Bean Team was running I did some shopping! 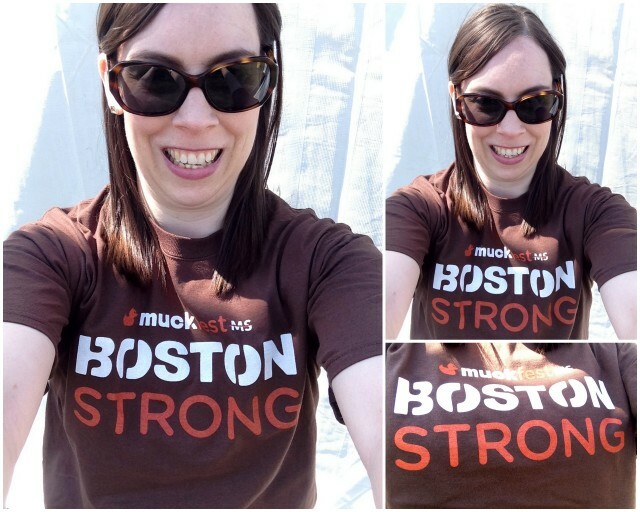 I got a "Boston Strong" shirt. The money went to the OneFund which is great. By the way as of today the OneFund has raised over 27 million! AMAZING! The starting line for the 10:00 AM wave! I walked around to several of the obstacles to take photos. 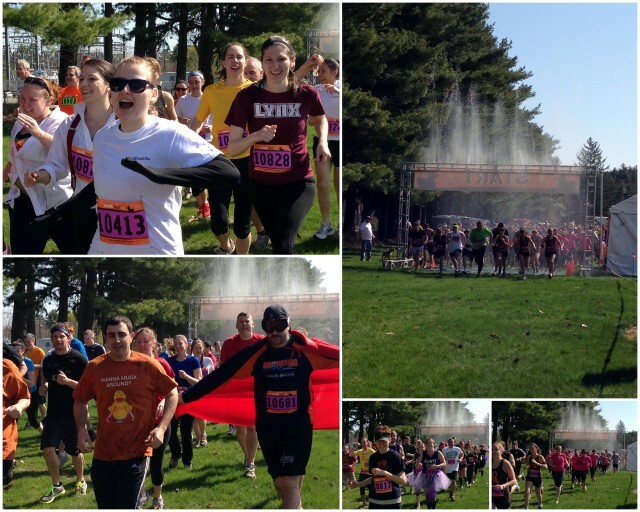 My team members are not in any of these photos but at least you can get an idea at some of the challenges they faced during their run! 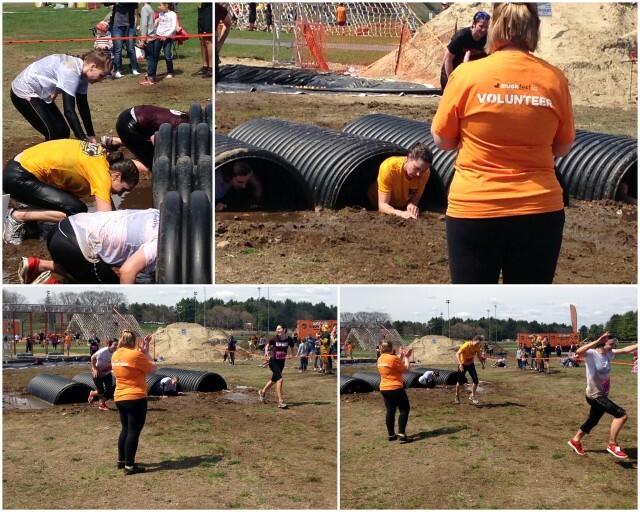 I was able to capture my team at the last few obstacles. Katelyn is in the yellow top (smart girl for wearing a stand out color b/c that is how I found her)! This water pit was deeper than it looks and cold according to the screams I heard! 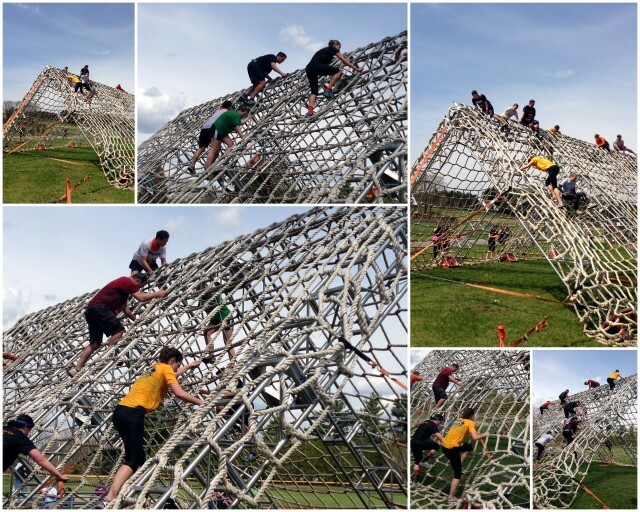 This climbing structure was really tall but they all got up and over it very quickly. Pretty impressive since they had run almost 5 miles at this point. 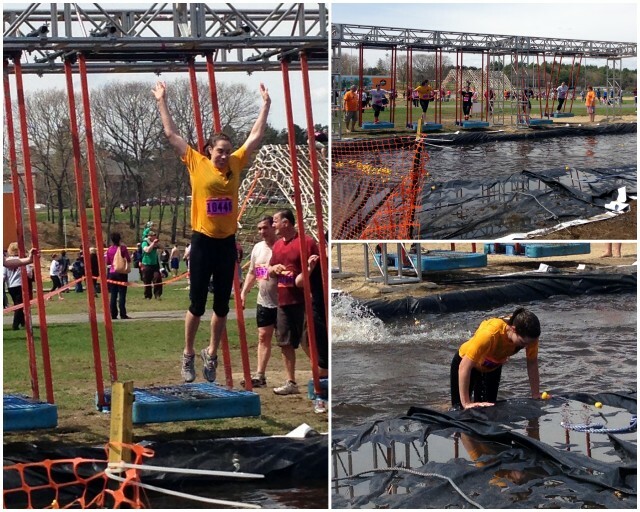 The 2nd to last obstacle. . . another swim! Katelyn looked more than happy about it! Again this water was deep - a good 6 feet. 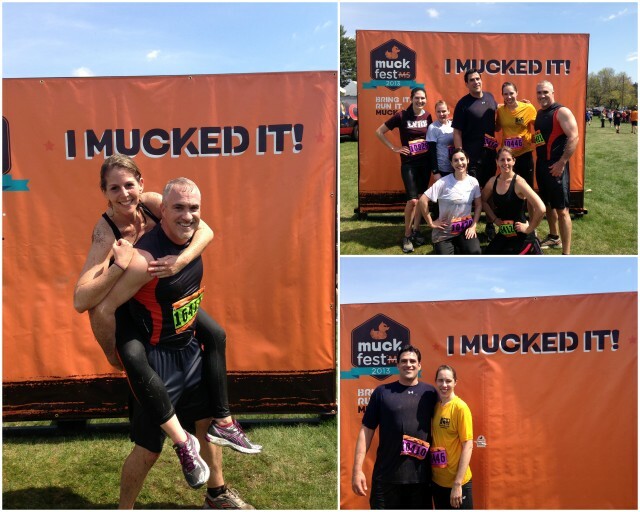 And just to make sure they were good and mucky before they finish the last obstacle had them crawl through a tube which was tiny and would require you to practically lay in the mud! Such good sports!! Wet and mucky for sure! The Bean Team rocked it and finished in just over an hour! Thankfully it was a warm day or else these cold showers would have been painful. 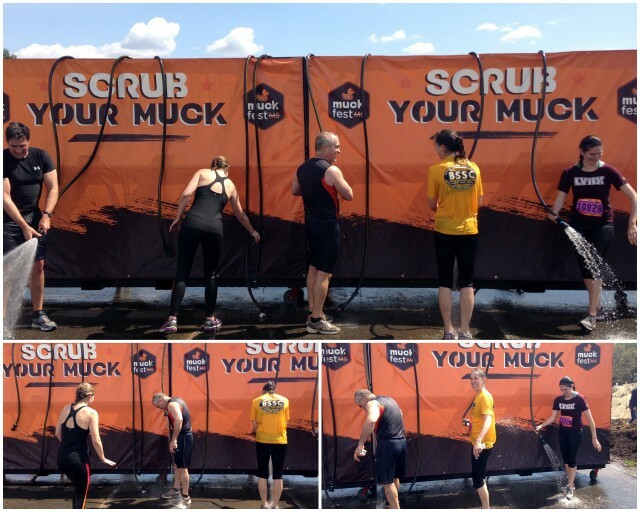 At least you could "scrub your muck" off! Oh and don't worry the guys made plenty of jokes about showering with the ladies! Once everyone changed into clean clothes we got to celebrate and relax with some food and beers! They had a band playing and everyone was just enjoying the warm sunny day. It was a great day! All of my team members said they had a ton of fun. I'm so glad to hear it. I had a lot of fun watching them. I also ran into many friends throughout the day which was great. Even though I didn't participate it seemed to me like this event was very well organized. Parking was easy, check in lines were short, areas were well marked w/ signs, etc. 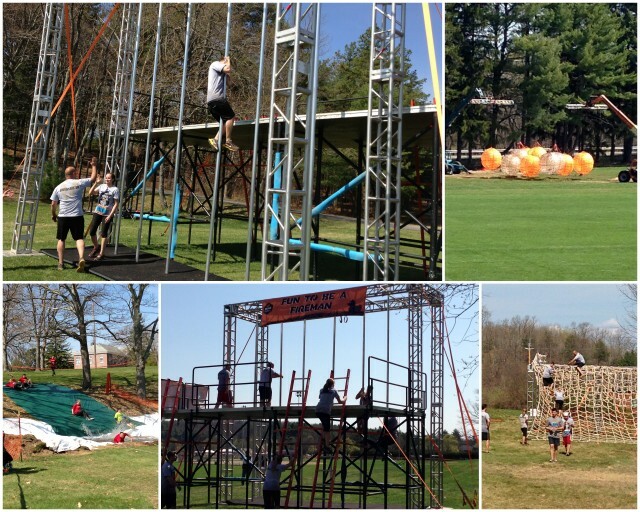 So if the MuckFest MS is coming to a city near you I suggest you check it out! I'm linking up with Sar and Syndal for This Weekend I. Last night I went to the LOFT grand reopening party at the Prudential. It was hosted by Blog Better Boston. Do you want to know what was so great about this event? It combined two of my favorite things. . .
Scratch that - three of my favorite things. . .
Shopping + Champagne + Bloggers = Fabulous! I walked into the beautifully remodeled store and was handed a glass of champagne. Thank you very much! I was then told to take a picture of my favorite clothes and to share it on Instagram with the hashtag #LOFTFavs. One person would be chosen to win $250 gift card. This dress (on the left) caught my eye immediately. Love it. Must try on! Adorable right?! I love when you love something on the hanger and still love it when you try it on. I think this dress is so cute. I'm going to save it for my California vacation in June. It is always so fun to have new things to wear on vacation! (Plus it will probably be too cold in Boston to wear it anytime soon but don't worry I'm not bitter about that at all)! Oh and do you want to know the best thing about social media? When you are shopping alone and need opinions you just post it on Instagram (follow me here) and within minutes you have all your friends giving you feedback. I received 16 "likes" and 9 comments telling me to get it. Well friends that was all the confirmations I needed! I checked out all of the accessories of course but somehow managed to have some self-control and didn't buy any! Such cute stuff though. Oh and I tried on a few other things too. I took this picture when I first went into the dressing room to document the champagne. A few glasses of bubbly and I'll look like Giselle in everything! Lol! I bought the dress and they put it in this cute reusable shopping bag. Doesn't that just say it all? Love it! By the way the dress is $79.50 but as you may remember from this post I never pay full price for anything at LOFT. I had a coupon that I got in the mail for $25 off a purchase of $75 or more and then I had a rewards card (a thank you for reaching so many points with my LOFT credit card) for $20 off. I was able to use both b/c the rewards card isn't a coupon! So I got the dress for $34.50! Good deal! So all in all it was a good night. Loved meeting Alana, Amy, Emily and Shauna and seeing Alana again. I don't know about you but when I come home to "fun mail" it really puts me in a good mood. Since most days I get lots of "junk mail" the good stuff is that much better. I love mailing friends and family cards and letters. Email/FB/Texting is all great but there is something so personal and nice about sending and receiving mail! 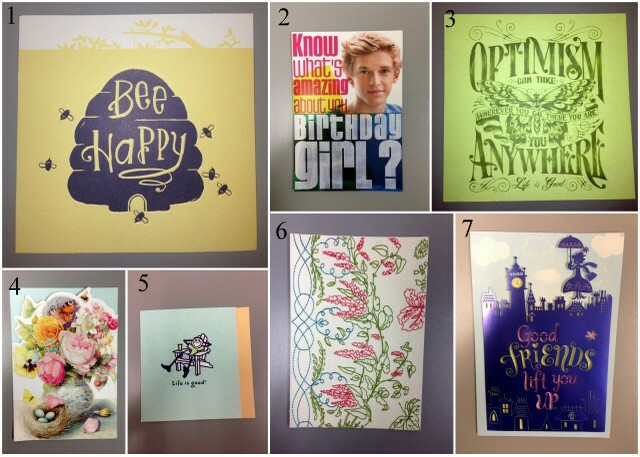 So when I was contacted to participate in Hallmark's Get Carded Challenge it was a no brainer. They provide me with adorable cards and stamps and all I have to do is mail them to friends. Sounds good to me. I received a variety of cards and even more than I was "required" to send for the challenge. I had to send 7 cards in 7 days - 1 for each day. 1. For the life of me I can't remember who I sent this card to. . . if it was you please remind me! 2. I sent this musical birthday card to my friend Kendall who lives in MA. At our age it is always fun to get a card that reminds us of our younger days! And what a hottie on the front! Hehe! 3. I sent this card to a patient in a hospital. I participated in a mail "event" for hospital patients and I thought this card was perfect for someone who was recovering! 4. I sent this birthday card to my friend Evelyn who lives in CA. Evelyn is an older woman and for some reason this card just look like something a grandmother would like. Hopefully Evelyn liked it! 5. "Life is Good." Who wouldn't want this to show up in their mailbox? I sent this to Evelyn's husband Art. He had a birthday just a couple of weeks after Evelyn. He is a happy-go-lucky gut and I think represents the "feeling" behind Life is Good. 6. This card looked handmade/crafty to me so of course the first person I thought of was Stacy. My good friend Stacy lives in London and we love sending snail mail to each other. She told me she loved the card and wanted to learn how to "sew on cards." 7. The Mary Poppins card was another one I knew who I would send it to as soon as I saw it. . . Rachel is a Mary Poppins fan so I used this as a thank you card after my visit to TX. She loved it! I heard back from the majority of the people who I sent cards to. It was especially nice to catch up w/ friends who live far away. While sending mail takes longer than sending an email there is something really nice about doing it. It made me happy to know that I brighten someone else's day! What is your favorite thing to get in the mail? Do you send snail mail? Need to buy some cards? Go to Hallmark.com and use the code "blog30" to get 30% off your order! Today is Monday. A day I usually hate. But today is a fresh start. Last week was a tough week. There is no doubting that. So today I will have a fresh start. I hope this week to be better for all of us. If this doesn't put you in a good mood then I don't know what will. 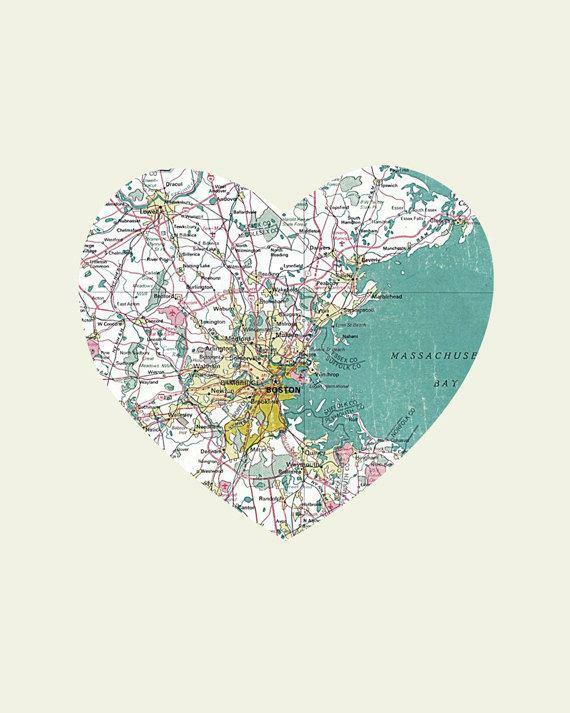 Spreading a little Boston love!! This song, The Boston Song aka "So Good" was actually created a few years ago by some Berklee College of Music students. Go here to read more about it. Mine was pretty good! Do you want to know what I did? Ate some Chick-fil-a which also makes me feel better every time! Blogged on both Saturday and Sunday. A weekend first. Check them out! Saw a play, The Irish. . . And How They Got That Way" written by Frank McCourt but more about that later this week. In other news somebody lost her very first tooth this weekend. . .
Not quite sure how this happened. Someone must have bumped her face and made it fall out b/c there is no way Peyton is old enough already for these kind of big kid happenings! Doesn't she look proud!? Hope the tooth fairy was good to her! Also included in my fresh start today. . . While I've been eating healthy for well over a month now I've hit a couple of bumps in the road (see Chick-fil-a reference above). So this week it is back to clean eating. No sugar, no sweets, no treats! I went grocery shopping yesterday and I am prepared for healthy eating all week! 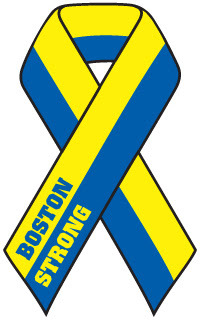 Don't forget to take a moment of silence today at 2:50 in honor of the Boston Marathon Tragedy victims. I'm linking up with Syndal and Sar for This Weekend I. Waiting To Exhale. . .
All day Friday I felt like I was holding my breath. I woke up around 6:00 AM and did what I do every weekday morning. . . turn on the news and then grab my iPhone to check email/FB/Twitter/IG. . . but this morning was different. Even in my sleepy haze I knew something wasn't right. As the towns in "lock down" flashed across the bottom of my tv I couldn't believe what I was seeing as my town scrolled by. 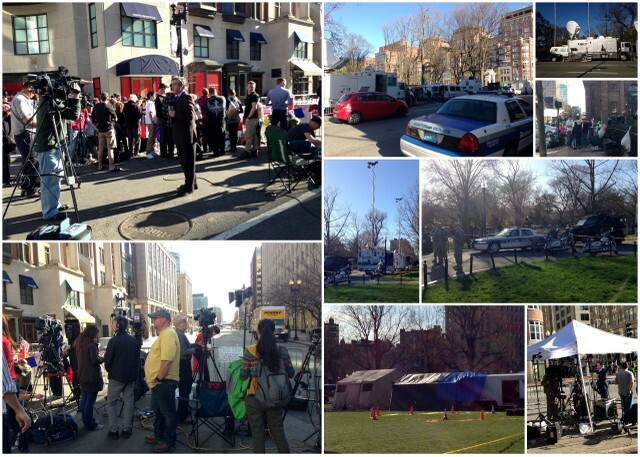 . .
Overnight the events started in Cambridge and continued into Watertown. Both towns are very close to me. I live in Brighton. Actually I live only one mile from where "command central" was set up - in the Watertown Mall parking lot (aka where Target is). I go there all.of.the.time. I mean it has Target! So there is a crazy terrorist/bomber/murderer on the loose just miles from my home!? As I watch the news footage of families being escorted out of their homes by police I had chills all over my body. Children in pj's being carried out by their scared parents. Was this really happening? I called my boss and left a voicemail that I would be late for work. I really thought this would all be "wrapped up" within a couple of hours. Little did I know it would last until late into the night. Next I called my parents. I knew they would still be sleeping but I also knew that as soon as my mom woke up and saw the news she would be freaking out. So I woke them. She was as shocked as I was. 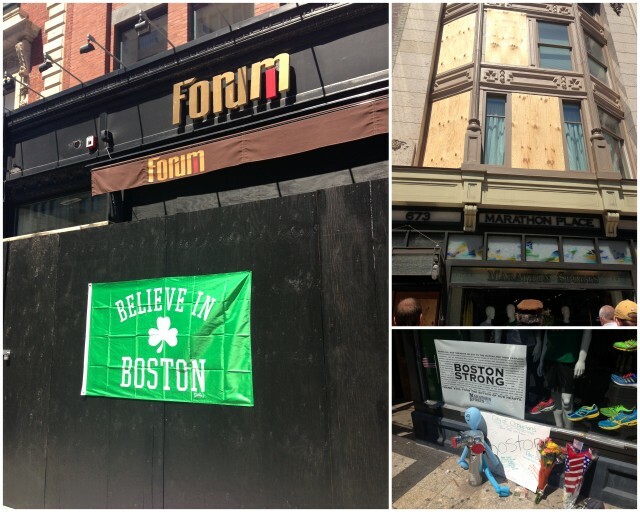 Within hours the entire city of Boston was "locked down." Colleges and universities all over the city and surrounding towns were closed, the MBTA (trains, subways and buses) were closed, malls and restaurants were closed and cabs were closed too. I literally watched the news for 17 hours. 17 hours! I don't think I have ever been that glued to the tv. I still haven't processed everything that happened. It is surreal. Unbelievable. Scary. Sad. I have never been so tense in my life. I listened to helicopters fly over my apartment and sirens drive by all day. I don't know if that made me feel more scared or safer!? I joked that I live in a brick building. Bullet proof? I kept thinking about him being on the run. . . into Brighton. . . into my neighborhood. . . near me. What if? What if the police come and ring my bell and tell me I have to leave my home? What if? 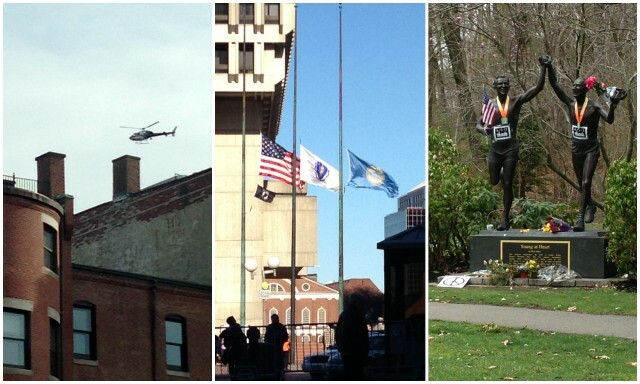 Thankfully (for me) the events stayed in Watertown. I felt so bad for all the people in that community. So scary for a "normal" town to all of a sudden be making international news due to a manhunt for a terrorist. When they lifted the "lock down" I did not feel safe. Nothing had changed - he still wasn't caught - but yet we were now allowed to go about our lives. Not me. I stayed right where I had been all day. Thankfully within a very short amount of time it seemed like they had found him. It seemed like it took FOREVER to find out if they really had him. I couldn't stand the waiting. He was found. In a boat. At a home on 2.5 miles from my house. Yes I googled it. Holy crap 2.5 miles. That was way too close. Yet it was far enough away that I was safe. Safe from gunfire. Safe from explosives. I just kept thinking about the people in that neighborhood - in that house! They must have been SO scared. I am so so grateful to the man who owns that house and boat - thank God he noticed the hole in the shrink wrap. Thank God he did the right thing and called the police. If I'm being completely honest, I wanted Suspect #2 dead, like his brother. It seems I may be in the minority with my thinking. I just wanted it over. I don't think he deserves amazing medical treatment at the hospital, I don't think he deserves a fair trial, I don't think he deserves anything. But I understand other people's views. I do. So now he lays in the hospital. In serious but stable condition. Will he talk? Will he tell us anything that will help us understand? I don't know. I only hope if there are others involved they will be caught too. So there you have it. My thoughts on probably what was the scariest day of my life. Hopefully I will never have to live through anything like that again. Praying that none of us do. THANK YOU to all of you who checked in on me. Thank you to all of you who send me emails, FB messages, tweets. . . I really appreciate all of you. 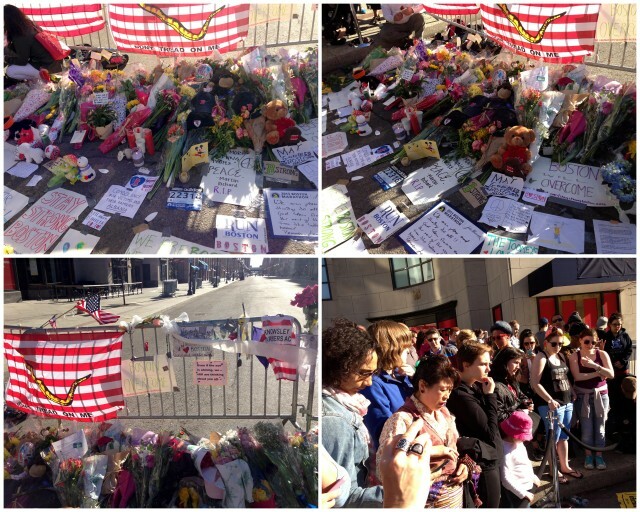 I could feel all the love for Boston yesterday. It felt amazing. I love Boston. I am so proud of this city. I am so appreciative and grateful to all of the people involved who "caught him." Governor Patrick, Mayor Menino, the police (both state and local), the FBI, and all the other BRAVE people who protected us. And to the medics, EMTs, doctors and nurses who had to care for and/or are caring for Suspect #2. . . I can't even imagine what it must be like. I don't think I could do it. I respect you all for being professional and doing your jobs. I wanted to share some photos I've taken this week. I've been amazed by much of what I've seen. On Wednesday, just two days after the explosions, I visited the memorial on Boylston Street in Boston to pay my respects to the victims and their families. Usually one of the busiest streets in Boston - closed. No shopping, eating and drinking. Instead people mourning. People praying. People in shock. 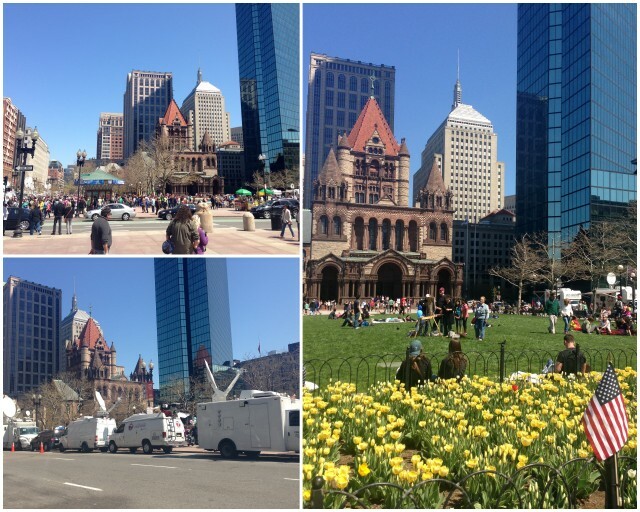 The Boston Common, Public Gardens and Copley Square area were filled with media and police. Again surreal. Not what I'm use to seeing in these parts. And yet just steps away. . . it is peaceful and calm. 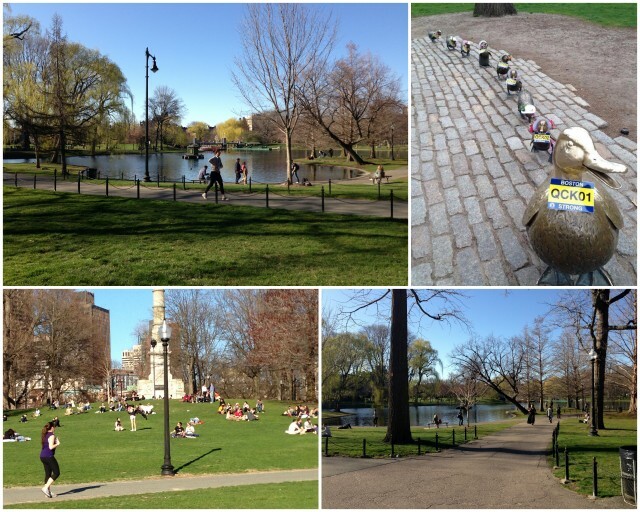 The Boston Common and Public Gardens were filled with Bostonians out walking, jogging, sun bathing, socializing and enjoying our city. So amazing to see this just 48 hours following the tragedy! Just another reason I love this city! 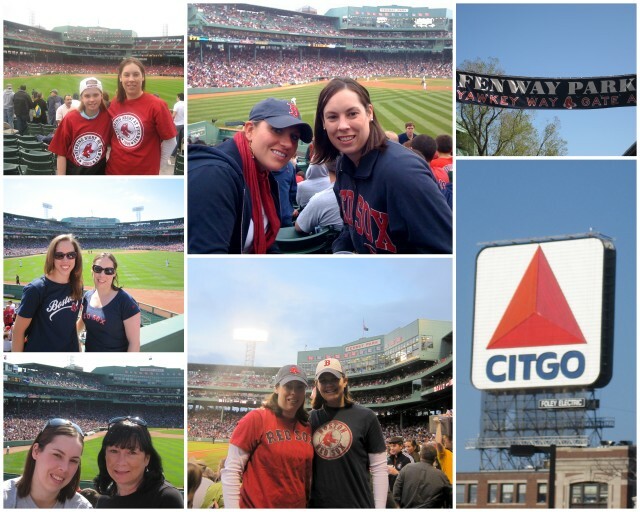 Proudly wearing a Boston Red Sox shirt on Saturday! I still have so many other thoughts swirling around in my head. But for now I think I've said enough. I'm kind of tired of thinking about it all. And then I feel guilty for feeling that way b/c I know the victims of this horrible tragedy still have months and months of healing and recovery. They can't and won't forget anytime soon. For me I need to move forward with my life. I need to get back to "normal" (whatever that is). I can move forward while still remembering and honoring. On Wednesday I will attend a (previously scheduled) blood drive at Boston College. I've donated blood once before during my #26Acts. 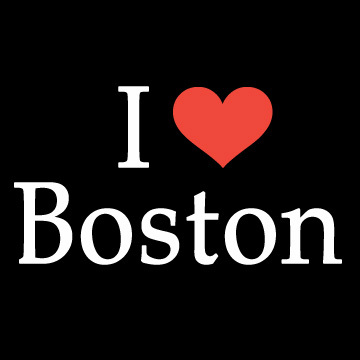 This time I will do it in honor of the Boston Marathon Tragedy victims. Boston Sports Are Wicked Cool! I'm still processing everything that happened yesterday. Until then here are some of my favorite moments from this past week! I know Boston fans often brag about our teams. . . here is why! Fenway Park pays tribute to the resilience of Boston and its people in a montage set to Jeff Buckley's rendition of "Hallelujah." It is 5 minutes long but totally worth watching. I LOVE this song - one of my favorites. The Red Sox are a class act. What an incredible ceremony at today's game. I wish I had been there. Here is a moment of silence, the ceremonial first pitch, all of Fenway Park singing the National Anthem and a special message (F bomb included) from David Ortiz! Neil Diamond surprised the team and the fans by showing up to sing "Sweet Caroline" in person. This is a Fenway tradition and I think it was very cool of him to come to Boston! The Bruins are pretty cool too. Wednesday night the crowd spontaneously starting singing along to the National Anthem at the start of the game. Most of you have probably seen this by not but if not it is really worth watching. 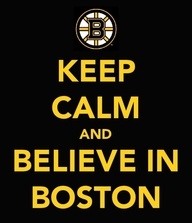 This makes me proud to be a Bostonian. Will I ever be able to listen to the National Anthem again without crying? Who sings it better - Red Sox fans or Bruins fans? I think with all of the sadness that has filled the past few days it is time for some laughter. It is ok to laugh. It doesn't mean we have "forgotten" what happen on Monday. It doesn't mean we don't care. There is room for both - we can still hold the victims close to our hearts while also finding some space for laughter. This is worth watching. It made me smile. I've never watched this show before and I don't know much about Steven Colbert but he is right on with his "report." Donate Money - The One Fund has been set up our Governor and Mayor and money will help the victims and their families. Donate Blood - In a week or two! 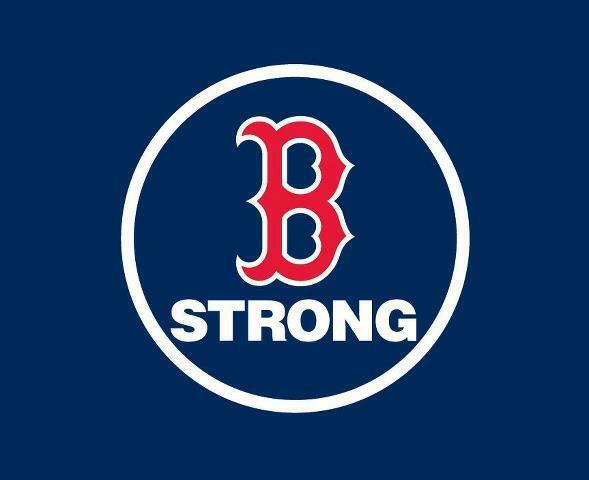 Boston hospitals have enough blood right now but have stated that they will need more. They recommend donating in the next couple of weeks. You can also donate with American Red Cross. I'm planning to laugh a lot this evening while seeing the musical Book of Mormon with my aunt and cousin. The tickets were a Christmas gift from my aunt and I'm really looking forward to seeing it. I hear it is very funny so it is coming at a great time. 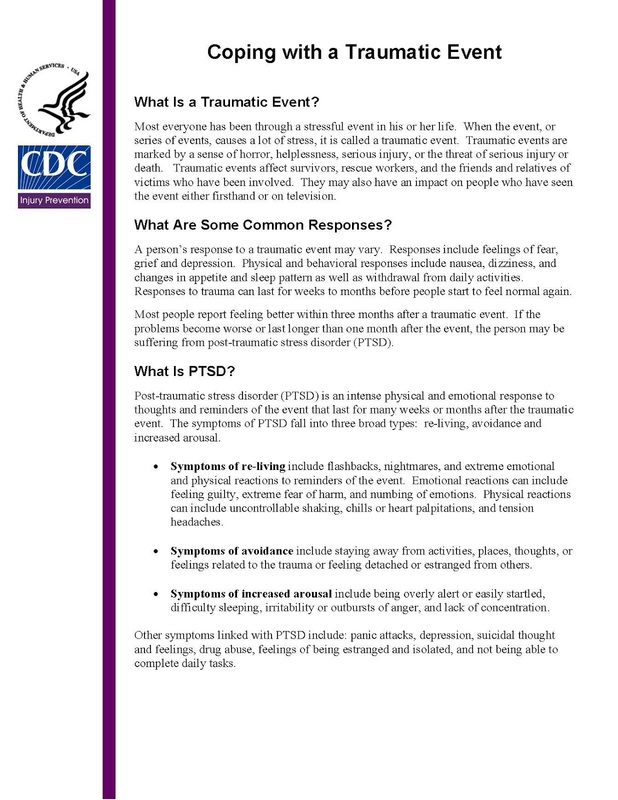 Here is another resource for talking to children about disasters. Today we pick up the pieces. 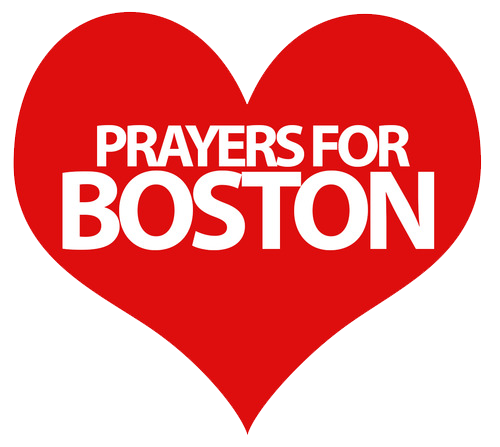 Today we continue to pray for the victims and their families. Today we continue to thank the first responders. Today we start to move forward. Today we focus on the good. There is so much good. Amidst the sadness we need to look for the good. Today we will praise the runners. We will tell them good job. They did it. Even if they didn't get to finish. Today we will thank the fundraisers. Let's not forget the millions of dollars that were raised to help others. This is good great AWESOME! I love Boston (well if I'm being completely honest I dislike the winters in Boston but other than that). Boston is a great city. With great people. And great sports! 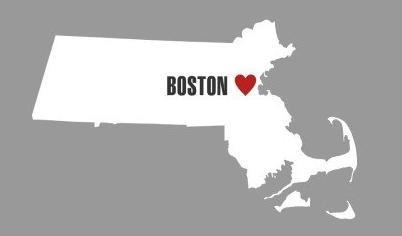 I am proud to be a Bostonian. Many of you have asked questions. So here are some answers. I live in Brighton which is part of Boston. My apartment is 4 miles for the finish line. I work in a suburb 20 minutes north of Boston. I drive to and from work. Things around the city are getting back to normal. There was traffic and people were heading to work this morning. The area being referred to as the crime scene is closed off to cars and people. It is about a mile area in the Copley Square part of Back Bay. It is currently April school vacation in MA. So kids are off from school. On a personal note - nobody I know was physically hurt by this tradegy. I'm thankful for that. On a professional note - I wish I worked at one of those Boston hospitals. As a clinical social worker I was made to counsel people during tough times. This is what I do. This is where I thrive. I feel a bit out of place being "here." I will still help people today even though I'm not in the city. People everywhere need support. For those of you asking what you can do. . .
For those of you who are asking what to say to your children. . .
Keep it simple. Let them lead the conversation. Reassure them that they are safe. Hug them. Tight. Here is a great article from PBS that might be helpful to you as well. There is so much more swirling in my head. So much more to say yet nothing at the same time. Senseless. How do you make sense of hate? For now I will try to focus all my swirling thoughts on good. I hope you will too. 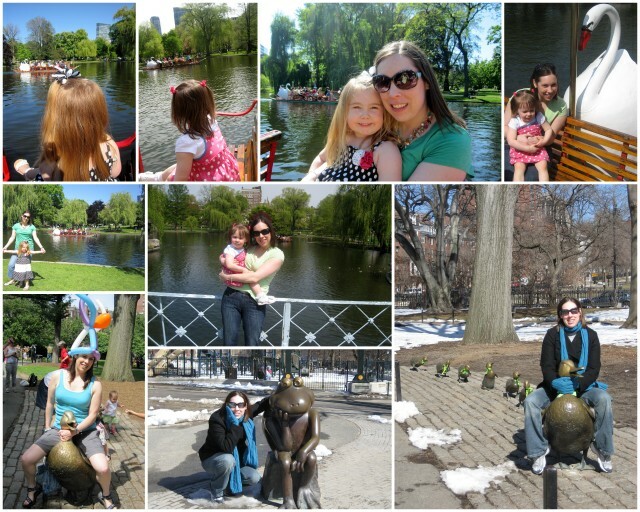 My two most favorite places in Boston are the Public Gardens and Fenway Park. 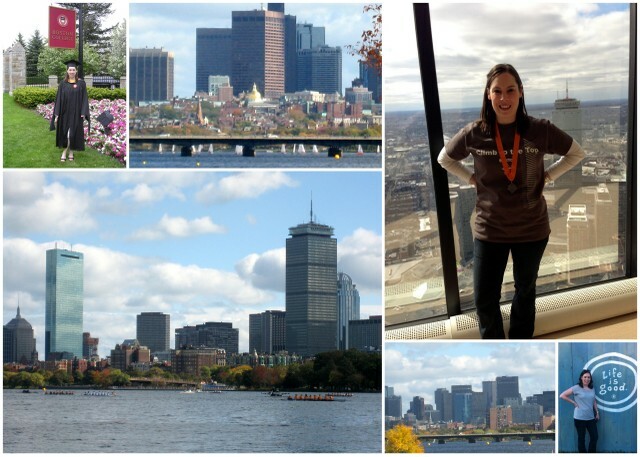 Sharing some of my favorite Boston memories with you. I hope you will all visit Boston so you too can experience how amazing it is. I'm linking up with Helene for Travel Tuesday. Hoping you feel inspired to travel to Boston!!!! Today I am Sad. . . Breaking Up Is Hard To Do. . .